You'll be £24.00 closer to your next £10.00 credit when you purchase Hunters over Arabia. What's this? 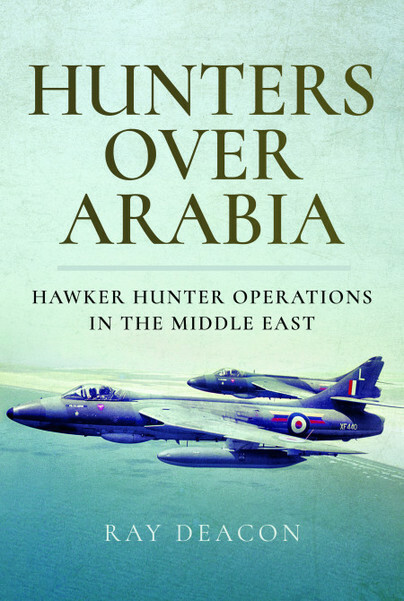 Based on official records held at the National Archives and other published sources, ‘Hunters over Arabia’ presents an in-depth account of the operations performed by the Hawker Hunter squadrons policing the desert wastelands and high mountain ranges of the Middle East. Copiously illustrated with colour and black and white photographs, a high percentage of operations performed by this versatile British ground attack and reconnaissance fighter are described in detail. Using a chronological format, the narrative focuses on the period during which the Hunter served in the Middle East, from 1960 to 1971. Further chapters are dedicated to the three Hunter variants most closely associated with the Middle East, the FGA.9, FR.10 and T.7, together with their respective allocation dates. A short background to Aden, its historical links to Britain, and RAF airfields administered by Middle East Command complete this factual account. Born in Farnborough, Kent, in 1942, Ray grew up in South-East London and went on to study at William Penn Technical School before joining the Royal Air Force. On passing out in December 1959, he was posted to the Central Flying School (CFS), before arranging an exchange with a fellow radio mechanic on the DH Vampire T.11 line. Much to Ray’s delight, the squadron was also responsible for handling Hawker Hunters the CFS Type Flight whenever they paid visits from their operating base at RAF Kemble. The opportunity to work on the ‘queen of the skies’ kindled a passion that has remained with him ever since. His career in the Royal Air Force involved service in Aden, where he lived for two years, working on a busy front-line operational squadron equipped with the more potent ground attack and fighter reconnaissance versions of Hawkers impeccable aircraft. He also worked at RAF Little Rissington on the Varsity squadron, a posting that was followed by time spent at the CFS Gnat Base Engineering Team, where he became familiar with the Gnats operating with the Red Arrows Aerobatic Team and 4 Squadron CFS. He left the RAF in May 1967. A year with the RAE at Farnborough was followed by a 25-year career in computing with IBM. Early retirement enabled Ray to dedicate his free time to carrying out in-depth studies of his favourite subjects; RAF Little Rissington during the CFS years and Hawker Hunter operations in the Middle East.